machinery for professional users. All products are manufactured exclusively at their location in Neubulach, making it easier for them to provide their goods directly to their suppliers. Tyrolit Australia prides themselves in providing their customers with the highest quality products and services; it is for this reason that Tyrolit has been supplying WEKA products to the Australian Construction Industry. 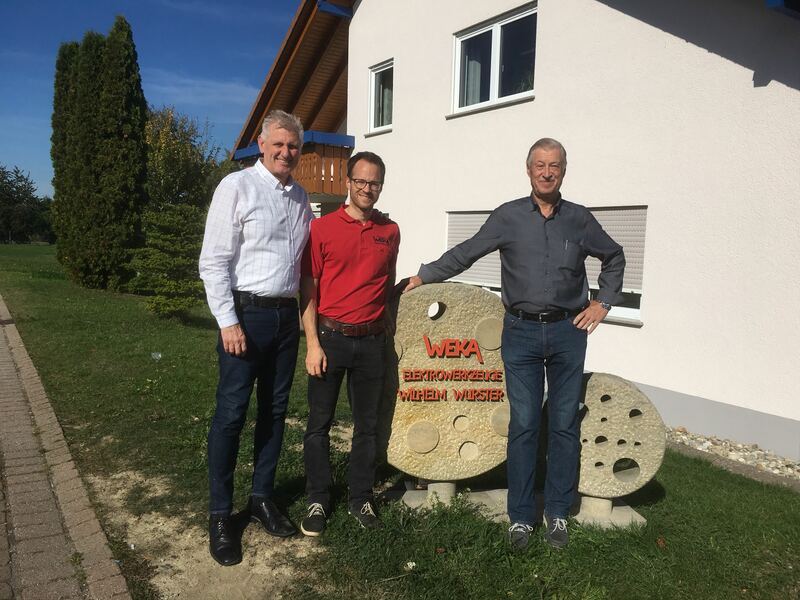 Traveling to Neubulach, Germany to meet the heads of WEKA, Danial Schrade, Wilhem Wurster; Phil has taken the time to strengthen the relationship between the two companies. The HF range of products is based on high frequency technology that enables product to be highly efficient and easy to use, offering customers the right solution for a variety of applications in the field of hand-held sawing. The range includes a frequency converter FU6 D, Power Cutter TS40, and the newly developed Ring Saw TR40, as well as the Core Drills HD16 and HD18. In developing and strengthening our partnerships with our European partners we are providing our customers with access to high quality and more efficient construction products. The series consists of the frequency converter FU6 D. The FU6 D can drive and control all devices of the HF series as a universal drive unit. The specially coded plugs for the different devices are recognized by the FU6 D and each tailored setting is applied to the individual devices. The frequency converter can be operated both at single-phase and three-phase, whichever connection is available. The Power Cutter TS40 is designed for versatility. With a cutting depth of up to 165mm (saw blade with 400mm diameter) the saw is characterized by a very good power to weight ratio – 6500W at 9.4kg. The newly developed RingSaw TR40 can be operated at single-phase (3700W) and three-phase (6500W). With a cutting depth of up to 300mm it is able to cut through a normal sized wall from one side. The HD16 and HD18 have extremely powerful high frequency core drills, stable construction thanks to a full metal housing, a 3-speed gearbox with oil bath lubrication and an overload clutch.